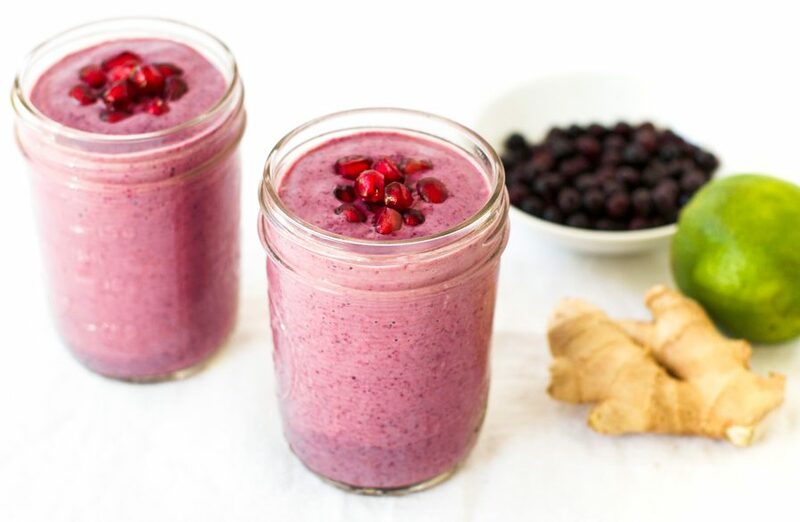 This wild blueberry ginger smoothie contains ingredients designed to maintain intestinal health – something that is particularly important for people suffering from an autoimmune disease. In recent years I have become increasingly aware of how many people suffer from autoimmune diseases. The National Institutes of Health estimates that up to 23.5 million Americans suffer from an autoimmune disease. The American Autoimmune Related Diseases Institution estimates that number is actually closer to 50 million. To put that into perspective, cancer affects around 9 million Americans. There are currently 80 to 100 autoimmune diseases that have been identified by researchers, with another 40 diseases that are suspected to have an autoimmune basis. Those numbers are significant. From a personal perspective alone, I know people living with Hashimoto’s thyroiditis, type 1 diabetes, rheumatoid arthritis, celiac disease, Meniere’s disease, psoriasis, restless leg syndrome, lupus, and multiple sclerosis. There is a lot we do not yet know about autoimmune diseases. However, one thing we do know is that there is often a strong link between intestinal (gut) health and autoimmune disease. For people diagnosed with autoimmune conditions, it is imperative that they eat a diet that provides the right nutrients to help heal their gut and maintain intestinal health. 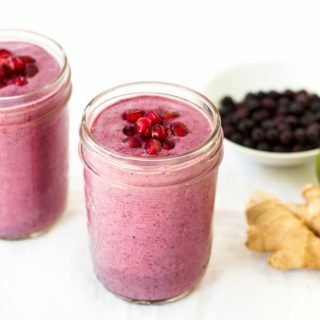 This wild blueberry ginger smoothie contains ingredients that can contribute to a healthy gut, including ginger, wild blueberries, banana, pomegranate, and fresh lime juice. In addition, by using coconut milk kefir, you can add gut-protective probiotics without adding dairy to your diet (dairy can be inflammatory for people with autoimmune diseases). 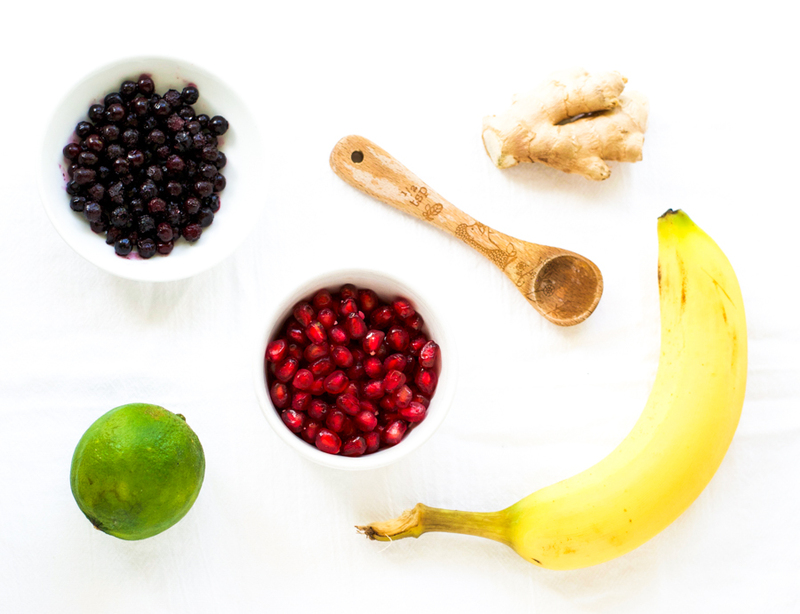 So if you are suffering from an autoimmune disease, this soothing smoothie can satisfy your sweet tooth while helping to improve the health of your gut. Put the blueberries, banana, avocado, ginger, lime, and kefir in a blender and blend until smooth. 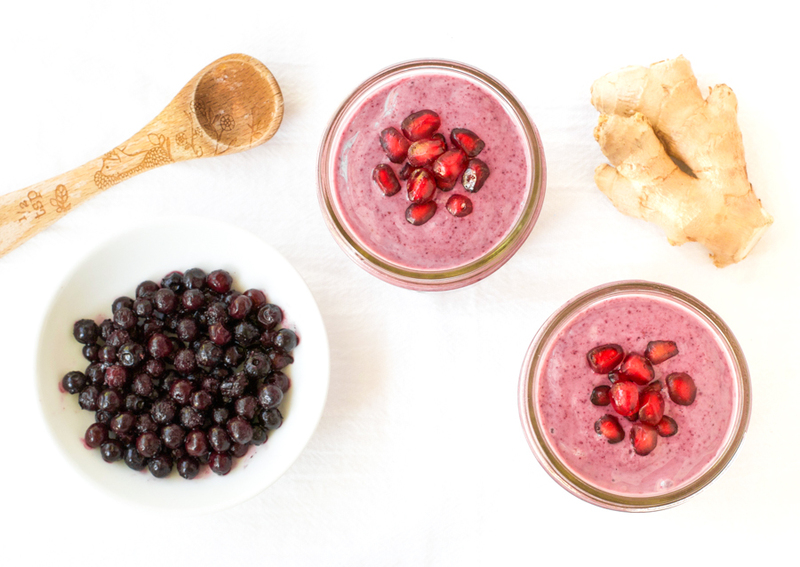 Pour into 2 glasses, top with the pomegranate seeds, and enjoy. 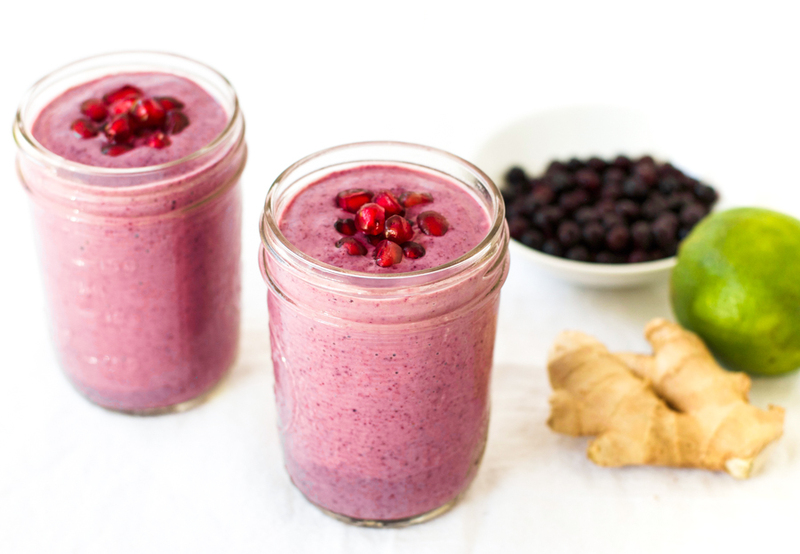 Healthy drink like this is always refreshing and enticing! It is definitely refreshing, and I’m glad you think it is enticing 🙂 Thanks! These look so good. I think I’m going to buy some wild blueberries today! Oh good 🙂 I hope you like it. 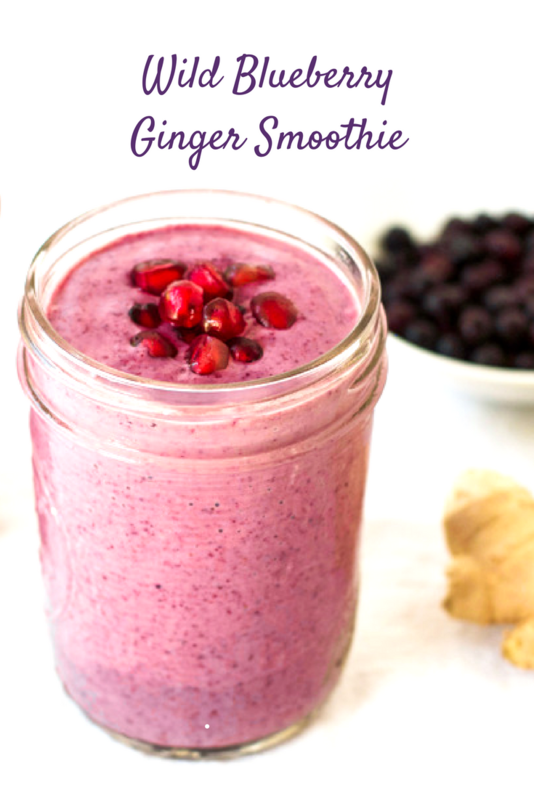 It is a great way to stay healthy as we approach winter cold and flu season with all those antioxidants and the anti-inflammatory ginger. Great recipe, yummy combination and a lovely start to the day! I usually buy frozen blueberries as it’s great to have them handy. And thanks for highlighting some of the research info and stats on autoimmune diseases. Thanks Rachel! And if you can find frozen wild blueberries, they are supposed to have even more antioxidants than cultivated blueberries.